Our facial scrubber removes impurities and buildup from pores and exfoliated skin, making your skin soft and supple. 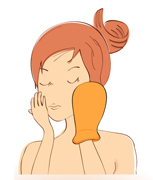 Regular exfoliation activates the skin for healthy, acne free, deep cleaning. Super effective skin cleaner surpasses any cleaning oil. Opens pores, revives skin cells, keeps skin elastic, young and touchable. 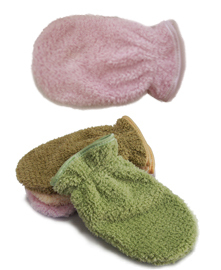 Use our facial scrubber right after a shower or facial cleansing when pores are still open. Wet the scrubber with water and then wring out the excess water. Wipe gently on face. To ensure cleaning is taking effect, you will feel some roughness which is perfectly normal. Our facial scrubber removes impurities and buildup from pores and exfoliated skin, making your skin soft and supple. For the longevity of the scrubber, please dry it thoroghly after each use.